Jealous when all the tech pundits got their own Samsung Galaxy Tab 10.1s at Google I/O? Be envious no more — the thinnest Android Honeycomb tablet in the world is finally being released to the public next week. Samsung just announced today that the maiden voyage of the “Tab 10” will be setting sail exclusively from the Best Buy location in Manhattan’s Union Square on June 8, nine days before it gets released to other retail locations on June 17. And, unlike the limited edition version that the I/O attendees got, this one will have Honeycomb 3.1 upon release. This is the Wifi-only device, and the price tag will be $499 for the 16GB version and $599 for the 32GB model. Verizon announced that it will also be making its LTE version available for pre-orders starting on June 8th, though its actual ship date is still unknown. (It says the “coming weeks.”) Customers will need to sign on the dotted line for a new two-year contract and pay $530 (16GB) or $630 (32GB). Both press releases follow. Check it out, and then let us know — are you planning to snag one? Samsung Galaxy Tab™ 10.1, World’s Thinnest Mobile Tablet, Makes Official Landing in U.S.
DALLAS, June 2, 2011 – Samsung Telecommunications America (Samsung Mobile), the No. 1 mobile phone provider in the U.S., and Samsung Electronics America, a market leader and award-winning innovator in consumer electronics, today announced the upcoming retail availability of the Galaxy Tab™ 10.1, starting June 8. The WiFi-enabled tablet measures at just 8.6 millimeters slim, making it the thinnest mobile tablet currently available in the world. The 32GB version of the Galaxy Tab 10.1 WiFi edition will be available for $599, while the 16GB version of the device will be available for $499. The Galaxy Tab 10.1 is powered by Android™ 3.1, Honeycomb offering faster and smoother transitions between different applications, more intuitive navigation to and from home screens and broader support of USB accessories, external keyboards, joysticks and gamepads. 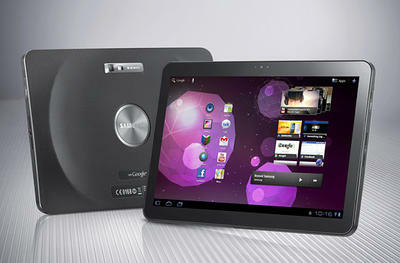 The Galaxy Tab 10.1 is the thinnest mobile tablet currently available in the world, measuring in at an ultra-slim 8.6 millimeters. The Galaxy Tab 10.1 also boasts an incredibly light weight of just 1.25 pounds (565 grams) for outstanding mobility and comfort in the user’s hands. Samsung’s TouchWiz user experience is designed with a Live Panel menu for customizing the home screen of the Galaxy Tab 10.1 with digital pictures, favorite Web sites and social network feeds. In addition, the TouchWiz UX includes a “Mini Apps” tray of commonly used features such as task manager, calendar and music player which can be launched while other major applications are already in use. The Galaxy Tab 10.1 software upgrade will introduce the evolution of Samsung’s popular movie and TV content service, known as Media Hub. Media Hub has been redesigned with a new user interface for even easier downloads of rented or purchased content. The new version of Media Hub also includes an HD Extender which allows the user to playback Media Hub content on TV through an HDMI cable from the Galaxy Tab 10.1 dock or adaptor. The Galaxy Tab 10.1 will also gain access to Samsung’s Readers Hub service, which is a robust library filled with more than 2.2 million books, 2,000 newspapers and 2,300 magazines. Also, the software upgrade will install Samsung’s Social Hub service, which aggregates email, instant messaging, contacts, calendar and social network connections into a single interface. The Galaxy Tab 10.1 will also receive Samsung’s Allshare service, for seamless content transfer between the tablet and other DLNA-enabled devices such as HDTV’s, monitors and digital cameras. The software upgrade will also transform the Samsung Galaxy Tab 10.1 into a device capable of accepting streaming content from a TV to the tablet itself. The Galaxy Tab 10.1 supports Wi-Fi 802.11 a/b/g/n connectivity to deliver rapid mobile download speeds and reduce data transfer times. The Galaxy Tab 10.1 also includes a Nvidia Tegra 1GHz dual core application processor for powerful gaming and multimedia performance. The Tab’s ultra-thin design does not sacrifice battery life, thanks to a 7000 mAh battery providing up to 9 hours of continuous use on a single charge. The device offers extensive Web browsing access through Adobe® Flash® Player compatibility. Flash Player delivers beautiful HD video, faster graphics rendering, and high performance on the Galaxy Tab 10.1 and is designed to take advantage of native device capabilities — enabling richer, more immersive user experiences. The Galaxy Tab 10.1 features a 3 megapixel rear camera and a 2 megapixel front camera providing smooth video chat capabilities and seamless 1080p HD video playback. High quality speakers are positioned on the right and left sides of the device for a rich, deep audio experience. The Galaxy Tab 10.1 is preloaded with the full suite of Google Mobile Services including access to more than 60,000 Android Market™ applications for Galaxy Tab 10.1, Gmail™, Google Search™, Google Maps™ 5.0 with 3D maps, and Google Talk™ with video and voice chat. The Samsung Galaxy Tab 10.1 WiFi edition will be available exclusively starting June 8 at the Best Buy Union Square location in New York City. Starting June 17, the Galaxy Tab 10.1 will be available at Best Buy online and in-store along with Fry’s Electronics, Amazon.com, Micro Center, Tiger Direct and Newegg. These retail outlets will have the 32GB version of the Galaxy Tab 10.1 WiFi edition available for $599, and the 16GB version of the device will be available for $499. In addition, the WiFi version of the Galaxy Tab 10.1 will be available through Sprint starting mid-summer 2011. Visit www.samsung.com for additional details. BASKING RIDGE, N.J. and DALLAS, June 2, 2011 /PRNewswire/ — Verizon Wireless and Samsung Telecommunications America (Samsung Mobile), today announced the 4G LTE-enabled Samsung Galaxy Tab™ 10.1 will be available on the fastest, most advanced network in coming weeks. The slim and sleek Galaxy Tab 10.1 debuts with Android™ Honeycomb and will be available in either Metallica Gray or Glossy White. Customers will be able to pre-order the device online on June 8 at www.verizonwireless.com/galaxytab4glte. When the Samsung Galaxy Tab 10.1 hits Verizon Wireless stores this summer, it will be accompanied by an array of optional accessories such as a full-sized keyboard dock and a multi-media docking station. The Samsung Galaxy Tab 10.1 offers full support for Google™ Mobile Services, including Gmail™, YouTube™ and more. Customers will relish the 10.1-inch enhanced display with a 1280×800 resolution HD screen, 1 GHz dual core application processor, a 2-megapixel front-facing camera and a 3-megapixel rear-facing camera. Both consumers and business customers will find a multitude of uses for the Galaxy Tab that range from video chat to business tools, including those that allow for the opening and editing of documents, spreadsheets and presentations. The Galaxy Tab 10.1 features Adobe® Flash® Player to deliver an enhanced Internet browsing experience and access to content-rich Websites. Verizon Wireless will offer two 4G LTE-enabled Samsung Galaxy Tab 10.1 models both priced with two year customer agreements: $529.99 for the 16GB model and $629.99 for the 32GB model. For more information on the Samsung Galaxy Tab, go to: www.verizonwireless.com/galaxytab4glte.